Call your local Police – They receive lost pet reports all the time and the pet you found may have already been reported. Call your local Animal Control – They’re a great source of lost animal reports and a great place to check and see if the pet you found is microchipped, which helps lead many pets straight back to their owners. 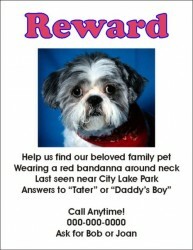 If you are not certain as to whether the animal is a lost or stray animal, it is best to post “Found Dog/Cat” signs in the area where the animal was found, as well as at local supermarkets, coffee houses and other public areas. You will want to include a short, vague description of the found animal and your contact information. Not including a photograph of the animal will help you ensure that the correct guardian has been located, based off of their detailed description of the animal. Please make sure you post a Flyer at Animal Care & Control – this is very important. Most lost pets are taken to the local Animal Care and Control facility. If the animal is not wearing a tag containing the guardian’s contact information, a veterinary clinic or animal shelter should be able to scan the animal for a microchip. It is recommended that you call in advance to check if an appointment is necessary and the costs for this service (many facilities offer this service free of charge for stray/lost animals). It is very important to report all found animals to the local animal control in the area where the animal was found, since the owner may search there as well. Chances are very good that someone is looking for the animal you have found, and time is of the essence to reunite them with their family, so please act quickly. If you are able to foster the lost animal until it is reunited with its owner, you should check with the animal control facility as to how you can do this. For example, you may be able to post a flyer at the facility and submit necessary paperwork in lieu of the animal having to be physically held at the facility for the specified holding period.